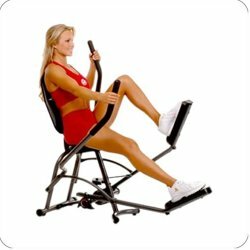 Introducing, the all new Body by Jake Cardio Cruiser, an entirely new kind of cardio workout machine designed to put you in your fat-burning cruising zone while also giving you an energizing total body toning workout - at the same time! With your help we can reach more people and let them know about Body by Jake Cardio Cruiser whether this product works or not. After about 3 days of use, the machine started squeaking loudly when used. ( Advertised as very quiet ). Then the friction device wore out and the cable between the footrests broke. Had trouble with warranty service and they don't sell parts. It took 3 months and many letters to get the parts. It is too loud to watch TV while exercising and takes much more than the 20 minutes a day claimed to get any results. The included manual suggests twice that 3 times a week, with 20 minutes as a mimimum. Save your money and go ride a bicycle 5-10 miles a day; more relaxing and burns more calories.